Now most of us see our contact clubs once in a while but not before have I heard of a school from a contact club’s town taking part in a Youth Competition. 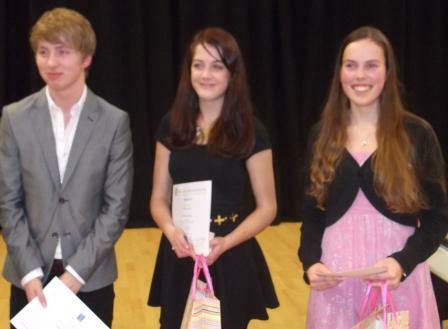 Recently Bexhill High School hosted a heat of ‘Youth Speaks’ jointly organised by the the Rotary clubs of Battle and Bexhill. There were five schools from the Bexhill Battle and Robertsbridge areas participating. Claverham community college (who won the Intermediate), Vinehall (a local prep school), Bexhill high, Battle Abbey and St. Richard’s Catholic College; but what’s this? The eagle Anything eye spots the name of ‘De Laage Waard’, now this is not a name I know. They come from Papendrecht, in the Netherlands where Battle have a contact club. The team from the De Laage Waard school took part but did not compete with their piece: ‘Early Birds and Night Owls’, a member of the audience who was there commented: “impeccable English and with a great touch of humour” – who knows, Youth Speaks may go international! And I know that the Dutch are often tri-lingual, but how much Dutch or Flemish can you speak? Let’s give them a ‘name-check’ – left to right, Wouter Sterrenberg, Mireille van der Stoep, Suzanne Heij. Their stay was hosted by Battle club and they stayed with Rotarian Michael Peacock, a member. They also spent the following morning with Battle Abbey School, and joined in classes there. Who did win, Anything? Battle Abbey won the Seniors, and Claverham, Battle, won the Intermediates, and they both go forward to the District Final in Maidstone on this Saturday 1st. March at the New Line Academy, Loose, in Maidstone. It starts at 1.30 and is free to enter, all Rotarians and their guests are welcome. Harold Lawrence was a Rotarian at the Bexhill-on-Sea club. 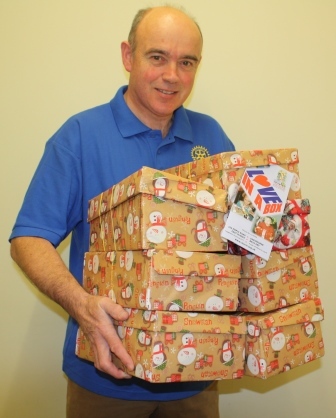 He also has one private passion, the ‘1066 Specials Disability Football Club’, which he formed 10 years ago when he was RC Bexhill club President. He has continued to give it his time and energy, over 250 people with special needs have been given the opportunity to play, and currently has 100 registered players from the age of 5, to 45. It has several teams playing in the South East of England amateur leagues, and recently played a Chelsea FC team – result, Specials 4 Chelsea 0! They were the only club this year to be awarded the ‘Queen’s Award for Voluntary Service’ which is the MBE for voluntary groups. 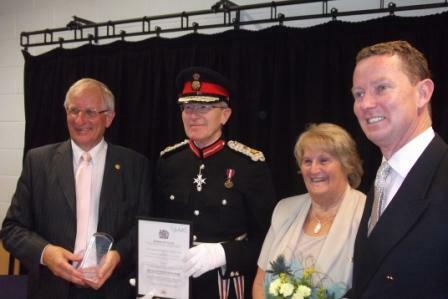 See picture below with Harold receiving the Queen’s Award and citation. At a meeting of the club recently he gave the club an update on this award, and thanked RC Bexhill for continuing to supply the players with their playing kit, and for four Rotarians being of the club’s Board of Trustees. 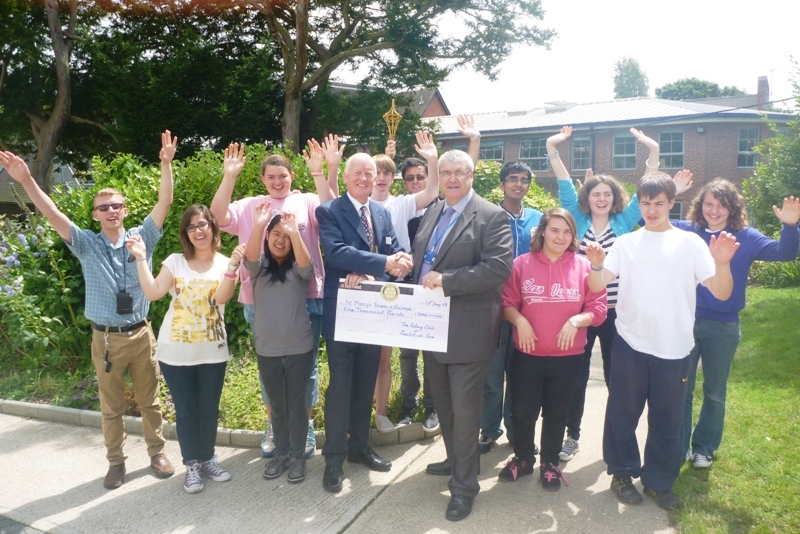 The photo below shows him receiving the award from the Lord Lieutenant of East Sussex (the Queen’s representative to the County), also in the picture are his deputy, and Gregory Barker, MP for Bexhill. Harold Lawrence is also a Paul Harris Fellow. I feel sure he will continue to make all the Specials feel extra special for a long time to come! Rtn. Harold Lawrence (left) receives Queens Award from LL of Sussex. John Cooper is RC Bexhill’s 90th. club President, and he started his year on the 1st. July. 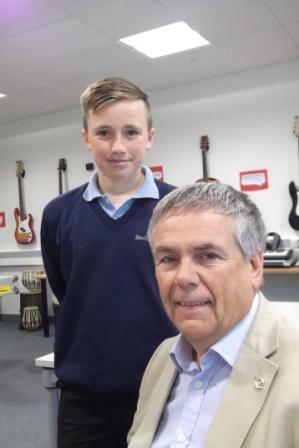 Never one to let moss grow on his feet he has started his year with a visit to the Bexhill community radio station – Bexhill FM, where he had a half hour interview from Louis Walker, a student from Bexhill High, who is one of the team at the radio station. He asked President John ten searching questions about Rotary both in Bexhill, and worldwide, which gave him the opportunity to tell their listeners about the many community based actions the club is taking in the town, and to expand on the ‘End Polio Now’ campaign which is reaching the end of a 25 year campaign. So a new experience for the President who was impressed, both by the station and the professionalism of his young interviewer. So, an old dog can learn new tricks!